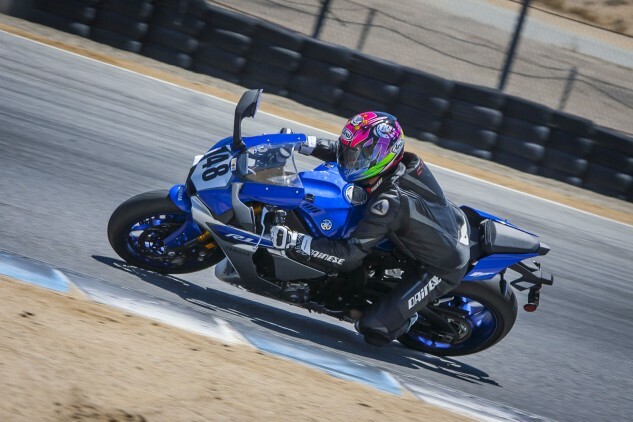 Six of today’s best liter-class motorcycles battle it out for track supremacy. 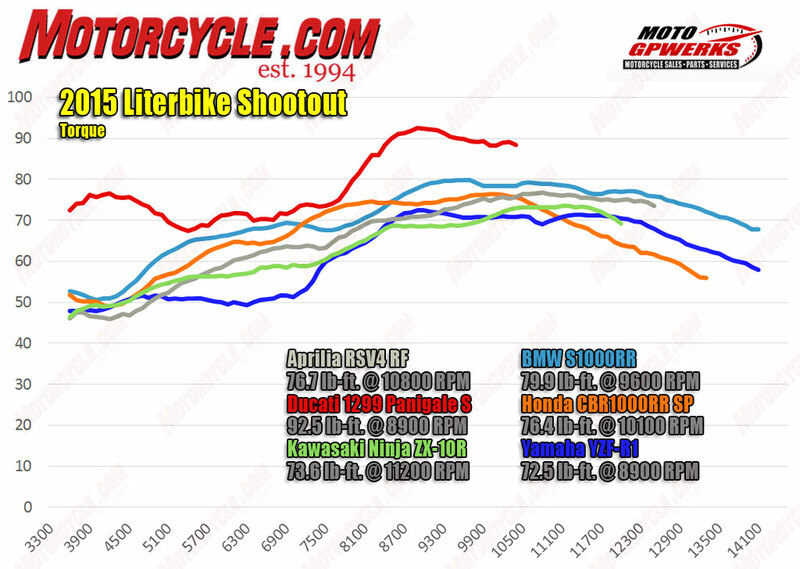 Rejoice, sportbike fans, as 2015 is bound to go down as the year of the liter-class superbike. After riding this latest crop of superbikes at their individual intros, your respective MO editors all came back gushing, proclaiming the bike they just finished riding is a viable contender for top honors in the class. Of course, with statements like that, pitting them all together and settling the score was the natural thing to do. And here for you now, we bring you the epic showdown you’ve long been waiting for, pitting five all-new or significantly revised superbikes on the racetrack against the Kawasaki Ninja ZX-10R, winner of our 2012 Japanese Literbike Shootout. Stay tuned next week for our street impressions. 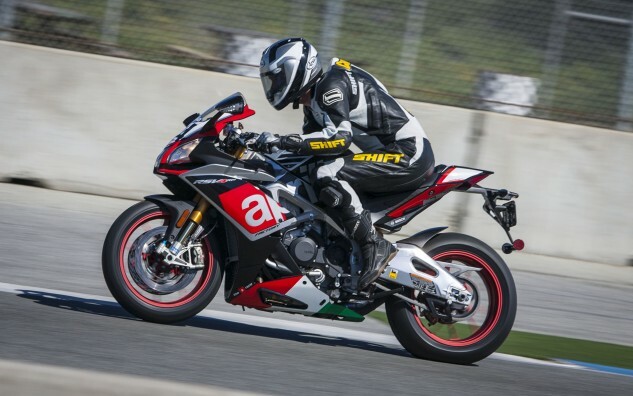 For this test, we’ve got three heavily revised European models in the Aprilia RSV4 RF (technically an early-release 2016 model), BMW S1000RR (with a second opinion from Sean Alexander here), and Ducati 1299 Panigale S. Not to be outdone, Japan is also represented in the major revisions category with the all-new, MotoGP-inspired Yamaha YZF-R1. Also representing Japan, though with slightly less revisions, is the Honda CBR1000RR SP edition, the CBR graced with Öhlins suspension, Brembo brakes, and what is essentially a blueprinted engine. For complete rundowns of each bike, refer to the hyperlinks above. Here, we’re focusing on overall impressions from the track. Leading the way on the horsepower scale is the BMW with the Aprilia and Ducati not too far behind. 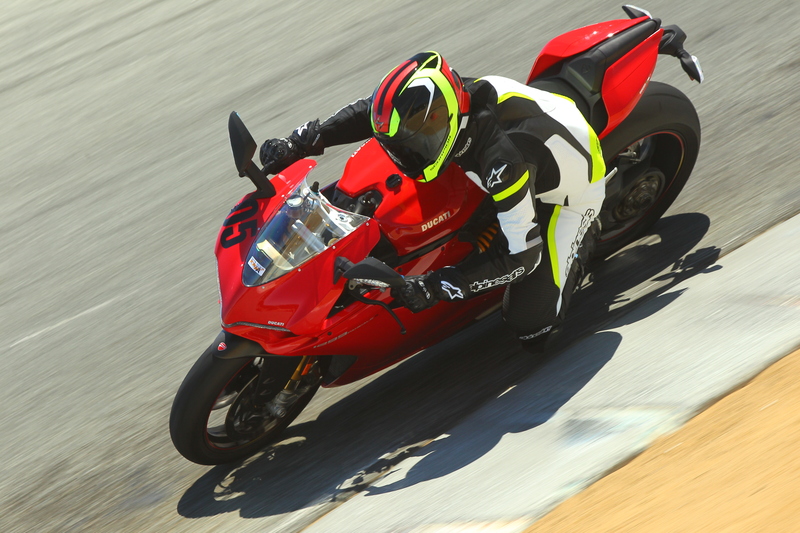 Below 10,500 rpm, the beefed-up Ducati is stronger than the rest. Considerably so in certain areas. 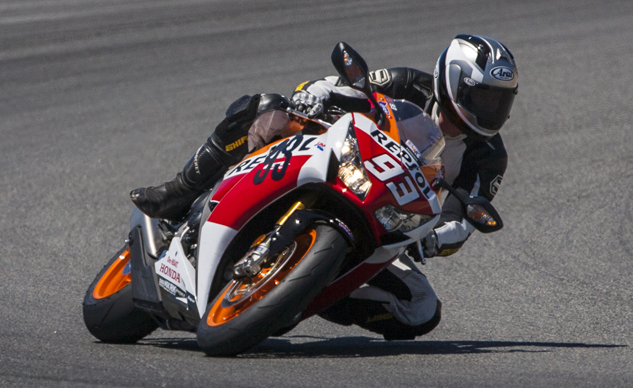 The Honda is very competitive in power until around 10k rpm, while the Ninja is relatively weak until its top end. Despite having six bikes in store, you might notice some omissions. There’s no Suzuki GSX-R1000 or KTM RC8. Both are fine motorcycles in their own right, but without any revisions for 2015 – and having failed to win our previous shootouts – there was no purpose in bringing them back. We invited MV Agusta to the party, hoping to be among the first to spin laps aboard the new F4 RC, but unfortunately MV couldn’t provide a unit for us to test. We also handed an invite to Erik Buell Racing to see if a 1190RX could be thrown in the mix, but with the untimely closing of the company’s doors, that request, sadly, could not be filled. 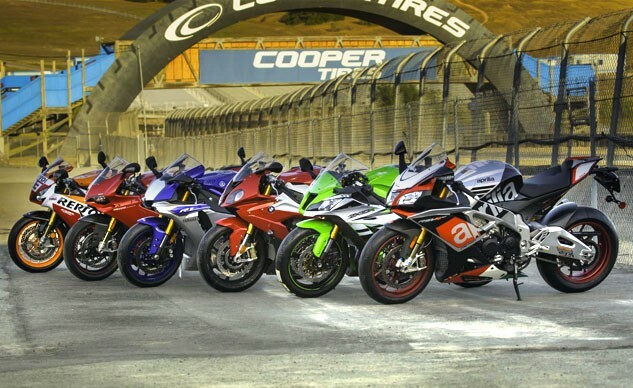 No matter, as the six parties we have represent the cream of the crop in the highly contested superbike wars. Combined, we have over 1000 horsepower (1007 horses, to be exact), 471 lb.-ft. of torque and a total of $115,327 worth of motorcycles. With numbers like that, we couldn’t take these bikes to just any racetrack. Oh no. 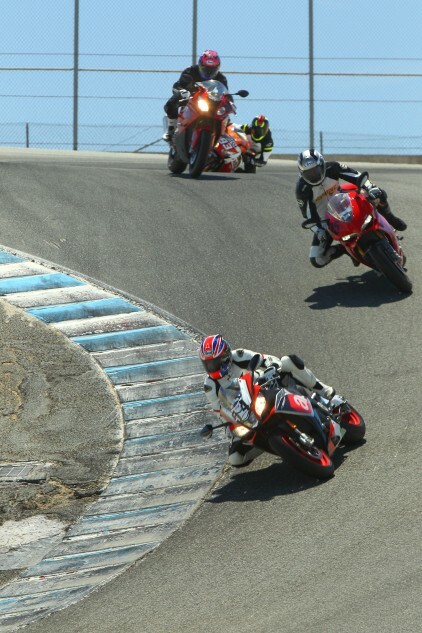 A special test deserves a special venue, and what better a place than the iconic Mazda Raceway Laguna Seca. 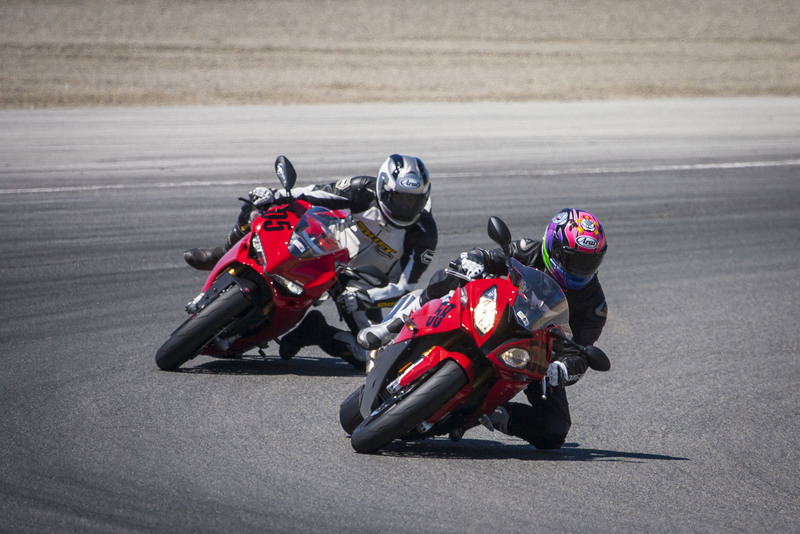 We joined our friends at Keigwins at the Track to ride with them for another one of their well-run and -organized trackdays at the historic Monterey track. Not surprisingly, with its displacement advantage, the Ducati makes considerably more peak torque than the rest. Of the four cylinders, the BMW and Honda show strong mid-range punch. Meanwhile, the Yamaha’s performance is a bit disappointing. Riding duties were filled by your usual MOrons including Sean Alexander, Kevin Duke, Evans Brasfield, John Burns and Yours Truly, but adding a bit of professional insight to the cast of wannabe heroes is an actual hero to all on staff: Three-time AMA Superbike champion, two-time World Superbike race winner, and former 500cc Grand Prix rider for Yamaha, Suzuki and Cagiva, Doug Chandler. Known for being fast, smooth and analytical, DC10 provided great feedback on all the bikes that we’re excited to share with you. First and foremost, a major thank-you is in order. At the 11th hour, Ducati informed us the 1299 Panigale promised for the track portion of our testing couldn’t be made available for our scheduled date. With panic mode firmly set in place, a call went out far and wide for dealers who would let us test one of their demo bikes. None ultimately committed. As a final act of desperation, we reached out to private owners willing to let us MOrons test their personal 1299 Panigale. 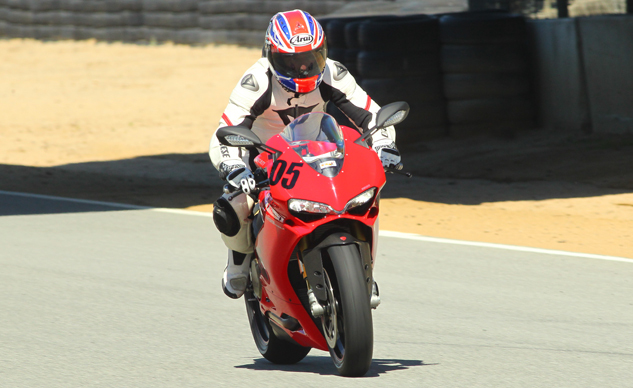 Nor Cal Ducati Desmo Owners Club member Jacob Tolley stepped up big time, allowing us to thrash test his own 1299 Panigale S around Laguna. The standard model might’ve been a better match here, but desperate times called for desperate measures, and for Tolley’s graciousness, we are forever grateful. Judging by this collection of top-class machinery, 2015 is possibly the best time to be a sportbike enthusiast. Lastly, another thank you goes to Pirelli, which supplied us with Diablo Supercorsa SC tires for all six bikes in their stock sizes (except the Honda, whose standard 190/50-17 rear isn’t available in the Supercorsa SC, so we used a 190/55-17 instead). As we’ve come to expect from the Italian rubber, their performance ticked all the right boxes: they warmed up quickly and stuck like glue the entire day, providing great traction especially at extreme lean angles. It was only in the late afternoon, after many laps had been completed, that we noticed even a hint of deterioration in grip levels. This test would not have been possible without the help of all the parties listed above and plenty others behind the scenes. Many thanks to all involved! While Evans, Sean and Kevin weigh each bike, Burns is busy staring at something shiny off in the distance. Because Laguna Seca imposes a strict 90db sound restriction during most events it holds during the year, measured between turns 5 and 6, riders are forced to go to extreme measures in order not to get punished by the sound police. Keigwins actually modified the course slightly, using cones to push riders away from the sound booth at the exit of turn 5. Still, of our six bikes – all with stock exhausts – only the Honda and Kawasaki were able to whiz past the booth at full throttle without tripping the meter. Instead, what follows are track impressions for all six bikes. Despite having to hold back near the sound booth, we were free to pin it everywhere else, allowing us all to form a pretty good idea of what each bike could do around a track. Make no mistake, all six bikes here would make potent track weapons for all but the most discerning of track riders. However, the chips have to fall somewhere, and here’s how each stacked up. A day late and a penny short is an appropriate saying for Honda’s aging literbike. Honda may have turned to Öhlins for suspension bits, Brembo for braking components, and only the finest pieces from its engine parts bin, but it still made the least horsepower of the group – 150 – which trails the BMW by more than 30 ponies. Its bones are the oldest here, too, as the current generation Fireblade was released in 2008, with a minor revision in 2012. Maybe the biggest indicator the Honda is a dated machine is its utter lack of electronics, as even ABS is omitted from the options sheet on the Honda (though you can still get ABS on non-SP models). 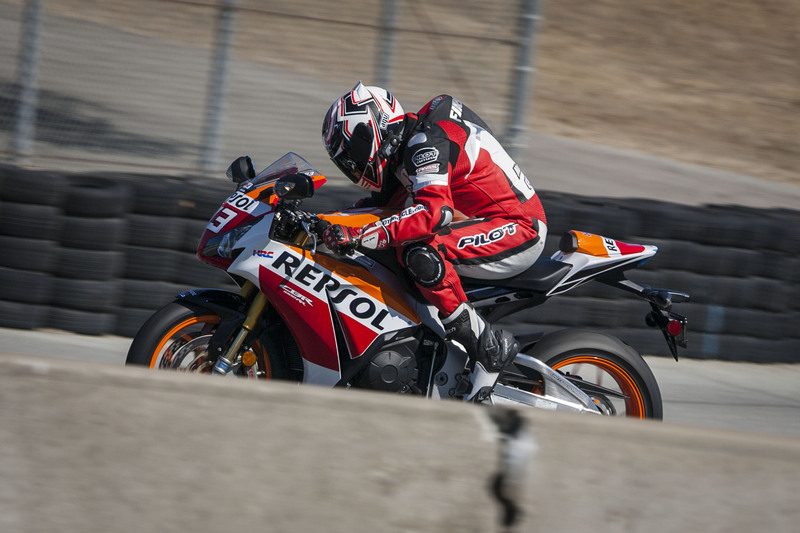 Evans, taming the analog CBR1000RR SP the old fashioned way – with his right wrist. The Honda has long been praised for its agility, but the Öhlins dampers help bring the confidence level up a few notches at full lean. With 76.4 lb.-ft. of torque on tap, the CBR makes more than both the Kawasaki and Yamaha (73.6 lb.-ft. and 72.5 lb.-ft., respectively), is almost identical to the Aprilia (76.7 lb.-ft.) and a whisker away from the BMW (79.9 lb.-ft.) in the twist department. 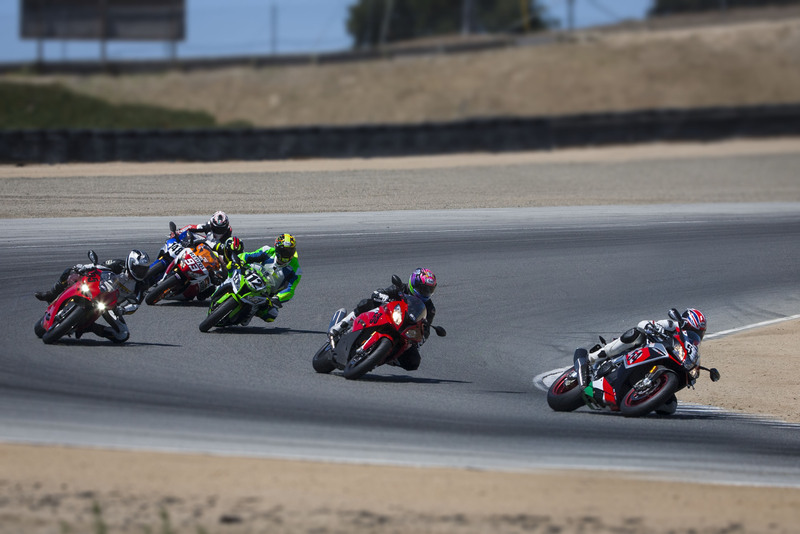 In some portions of the track, especially the chutes connecting turns 2, 3 and 4, where there aren’t any long straights, the CBR could hang with the others. But once the revs started to climb and horsepower began to dominate, the Honda fell short. 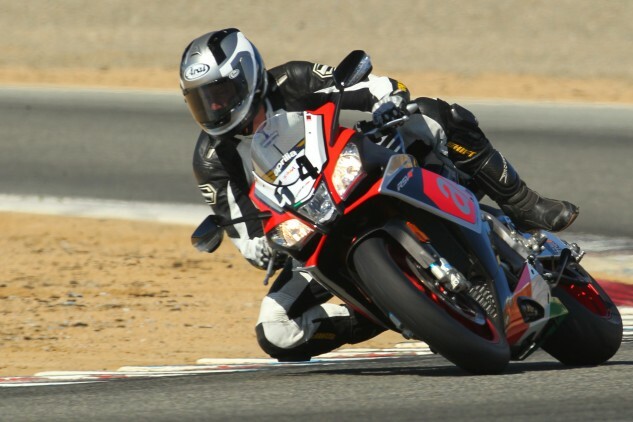 From there, our testers had other, lesser quibbles about the Fireblade. 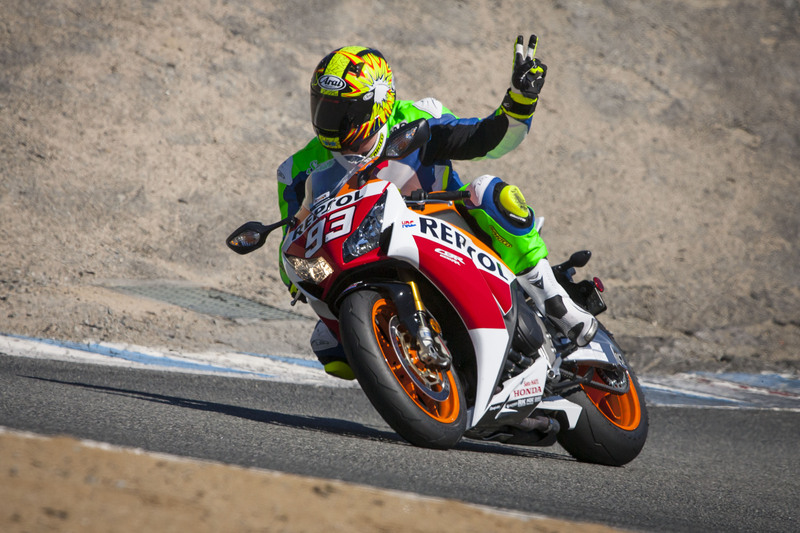 While I personally was a fan of the Brembos on the Honda, a sentiment shared with both Alexander and Chandler, Brasfield, Burns and Duke ranked the CBR’s binders amongst the lowest in their subjective scores. “The SPs Brembos deliver solid power, but it’s sent via more lever travel than the others in this test,” notes Kevin. Some complained of abrupt on/off throttle response, while others noted a notchy shifter. 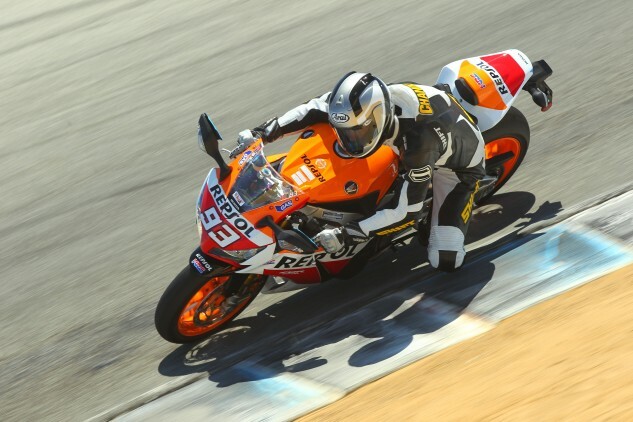 For Chandler, the Honda brought back memories of the racebikes he’s more familiar with – the ones without so many buttons. Ergonomically, the pegs are 10mm rearward, clip-ons angled five degrees lower and spread out five degrees more compared to the standard CBR. This prompted 6-foot, 2-inch Sean to note “the seat-to-peg relationship and distance feel more cramped than the competition to me.” Chandler, hovering around the 6-foot mark, was of a different opinion, stating “This bike also has a good fit; shorter or taller riders can fit quite well on this bike.” It’s up to the individual to decide which position feels best for them and their riding style. The CBR1000RR SP might be the backmarker in this group, but at least with the SP model, Honda is ensuring it ages gracefully. It’s slightly odd to see the ZX-10R this far back in the pack, especially considering it’s our reigning Japanese literbike champion, but it just goes to show how the rest of the field has upped the ante in this class. 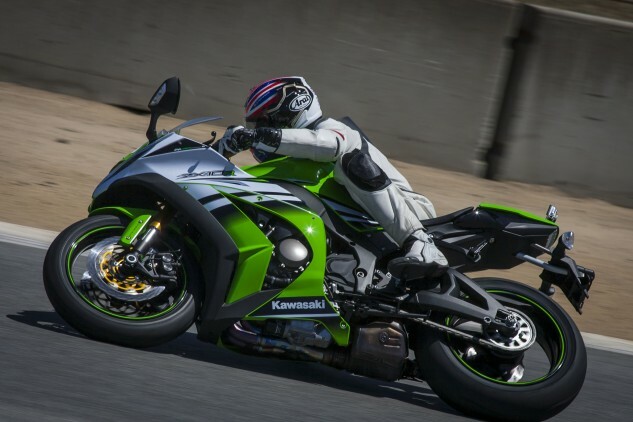 Still, the Ninja is no slouch, as its recent success in World Superbike clearly demonstrates. Kevin was particularly impressed with the ZX-10R’s stability on corner entry, even when still hard on the brakes. As mentioned before, the binders on the Ninja garnered praise from our testers, ranking third on our scorecard, trailing only the Aprilia and Ducati. Making this feat more impressive is the fact the name on the side of the caliper is not Brembo, but Tokico. Also, the lines feeding the calipers fluid are rubber, not steel-braided. Not that we could tell a difference; braking power was strong on the 10R. 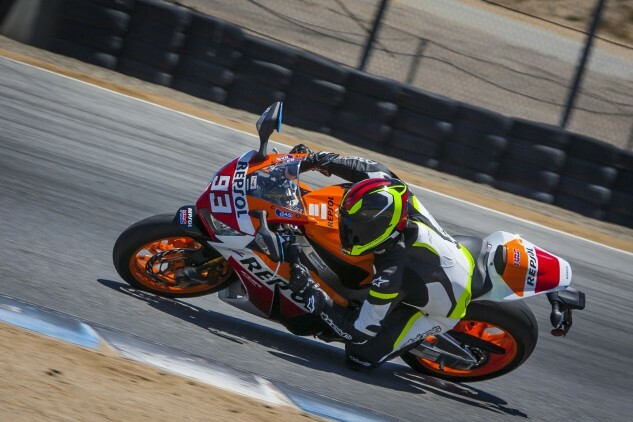 “The feel and stopping power felt like a race bike should,” said Chandler. 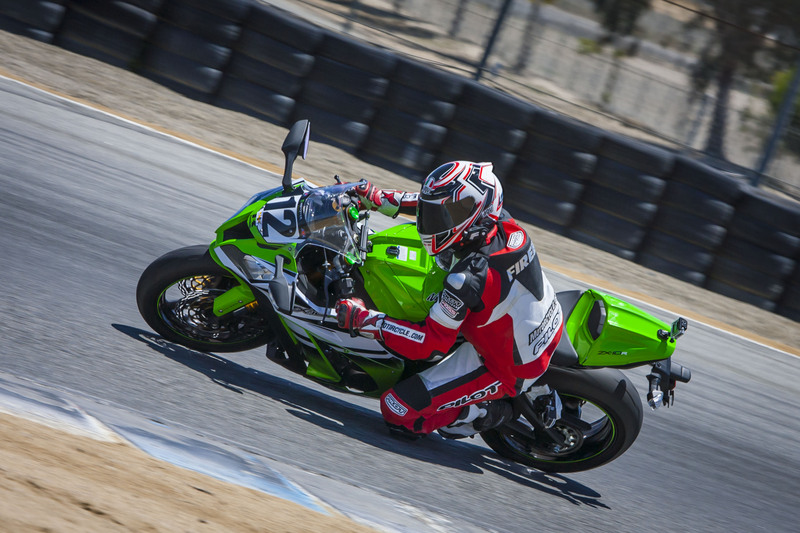 Our tester came equipped with optional ABS, bumping the price tag up $1000 compared to the non-ABS version, but even during hard track riding, there were no complaints of the system kicking in when it shouldn’t have. That’s saying something considering how hard one squeezes the brakes at turns 2 and 11. Chandler showing the proper line through Laguna’s turn 6. He had issues early on with dragging hard parts on the ZX. Adding rear preload and shims to the shock, thereby increasing rear ride height, solved the issue. Maybe it’s our familiarity with the Kawasaki that made it so endearing. Having crowned it a past champion, we knew what to expect out of it, but actually hopping aboard after so many years away from it and experiencing its agile chassis, stellar brakes and playful motor was a refresher course in what it can do and why we gave it the nod in 2012. At $15,599 as tested, it’s also the least expensive bike in this group. Because the ZX-10R isn’t bright enough in its 30th anniversary color scheme, Sean took it upon himself to up the brightness level with his custom Gimoto leathers. 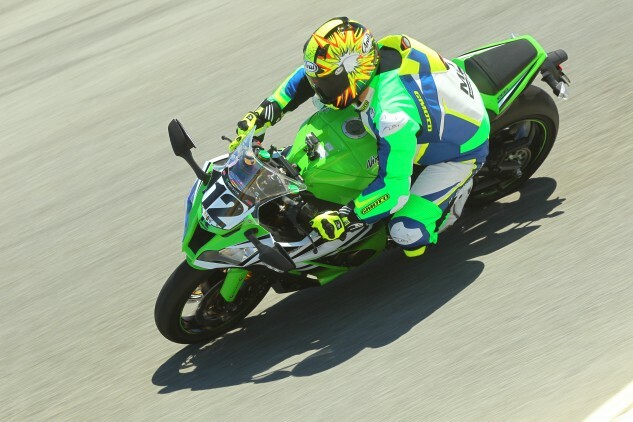 Gearing and a quickshifter are easy fixes in the aftermarket, and many privateer racers are having success with the Kawi, but in the context of this test, the competition has simply pushed ahead. You know when your friends hype up a movie so much that, when you finally see it, you can’t help but be let down? 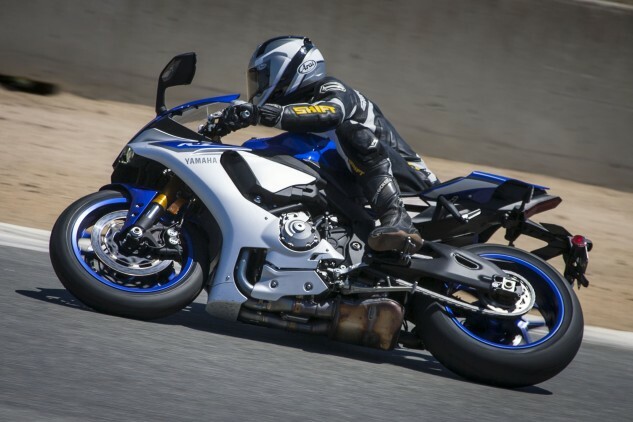 The new Yamaha R1 might have fallen into that trap, and I’m partially to blame after raving about it during my first ride at the bike’s launch in Sydney, Australia. 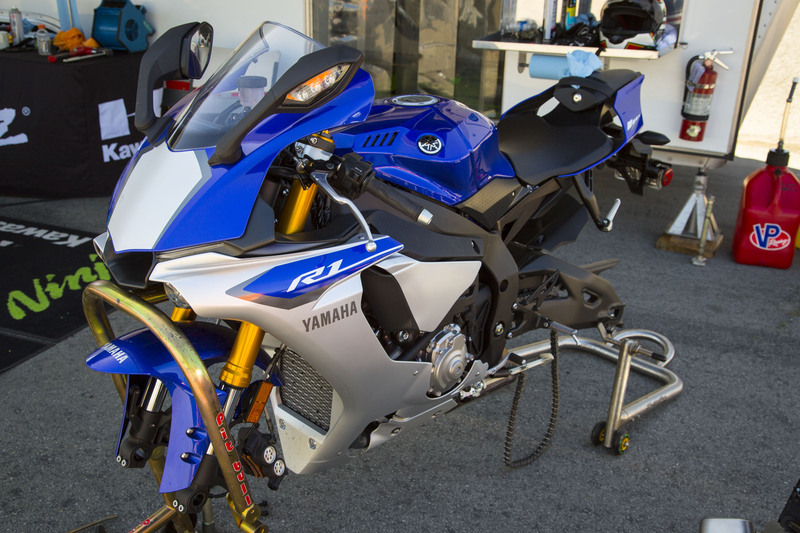 “I had very high expectations for the R1, so it was surprising to not fall fully in love with Yamaha’s technological tour de force,” said Duke. There’s a lot to love about the new R1, but it fell a bit short of expectations. We lead off with the bad news on the R1 because, as Duke notes, “there is lots to like, including a broad powerband with sweet crossplane-crank symphony.” Sean backed that feeling, noting, “engine feels strong and sounds great, particularly in the upper midrange.” Chandler agreed, writing, “the power on this bike was very smooth, good pull all the way through with a hint of going flat on the top-end side of it. 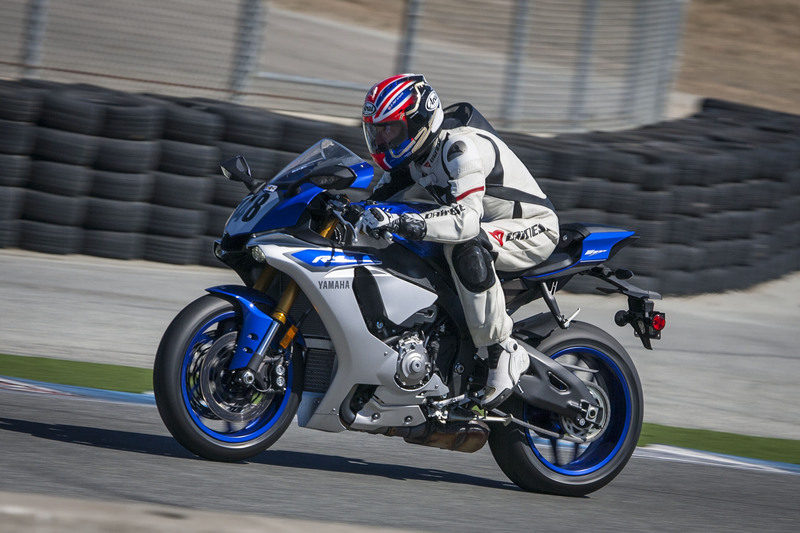 Sean wasn’t particularly a fan of the R1’s front end, citing a general on-track lack of feel and confidence when paired with our Pirelli Supercorsa test rubber. Interestingly enough, the praise for the Yamaha’s engine goes to show that numbers don’t always tell the whole story. Our R1 tester put down 162.9 hp, hardly more than the Kawi’s 160.6 hp, and made the least amount of torque in this group at 72.5 lb.-ft. In fact, at approximately 6000 rpm, the aging Honda is pumping out 15 more pound-feet than the Yamaha. The reason for the poor showing comes down to sound emissions. “The U.S. ECU is developed to meet U.S. regulations for exhaust and noise emissions which are not the same as Europe,” says Marcus DeMichele, Yamaha’s media relations manager, when asked by Kevin Duke after testing the new R1 on three different dynos. (Read the full story here). None of that really matters when you’re leaned over, WFO, cresting the blind Turn 1 with the front wheel barely skimming the Earth. All we could tell was the R1 felt fast, and we were fortunate to have a highly sophisticated electronics package with lift control, slide control and traction control, just to name a few, there to save our butts if we needed. Get the crossplane crank spinning on the R1 and the sounds it makes are truly captivating. At $16,490, the Yamaha is barely more expensive than the Kawasaki, yet comes with advanced electronic rider aids, exotic materials, and a thrilling MotoGP exhaust note the ZX-10R can’t come close to matching. Thanks to its aluminum tank, magnesium wheels and lightweight engine components, our R1 tester tipped the scales at a svelte 438 lbs., ready to ride, second only to the frameless Ducati’s 427-pound wet weight. If you’ve got some stands, a solid set of tools, and a desire to unleash the R1’s full potential, we believe you’ll be rewarded for your efforts. Personally, I agree with DC10, who noted the R1 “felt very track worthy but still needed some fine tuning – it just wasn’t as finished as some of the others.” I gave a valiant effort trying to get the R1’s settings to a good point but simply ran out of time. If you’re the tinkering type, then don’t write off the Yamaha just yet, as it has mounds of untapped potential waiting to be uncorked. “I think with a day or two you could get the finish of the bike much closer and have a very potent track bike,” says Doug, and I agree. The race for the top spot in this shootout is incredibly close and this is where the gloves come off, as the top three machines are separated by a total of 1.2%. 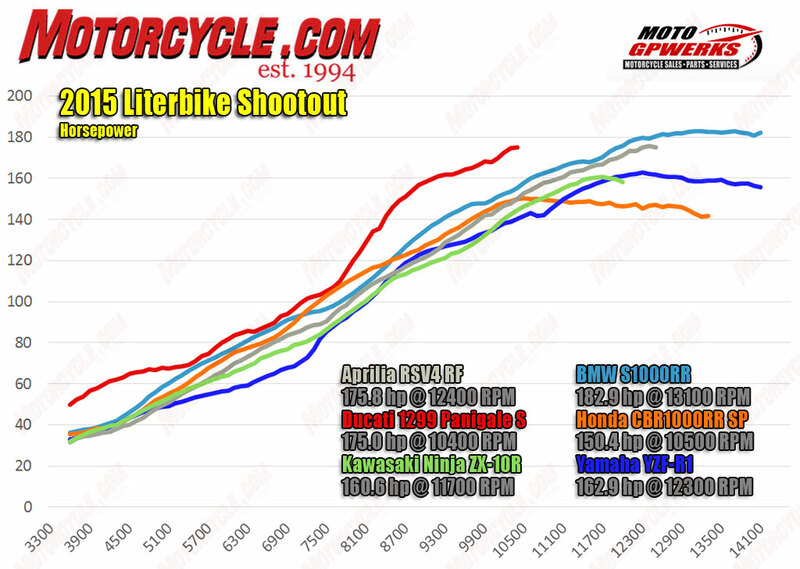 Despite the 1299 Panigale S version’s steep $24,995 price tag, the largest here, making a big dent in its objective scoring, the 1299 still recovered well enough to grab the third spot. With 175 thoroughbreds to its name and a whopping 92.5 lb.-ft. to go with it, Ducati most definitely assured nobody would even hint at the 1299 Panigale lacking midrange, as some had done with its 1199 predecessor. 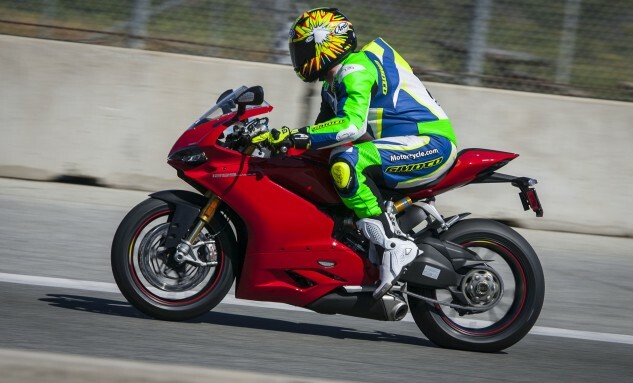 Ducati’s latest superbike impressed with its midrange hit coupled with its top end push. I shared the sentiments of my esteemed colleagues, jotting things like “beefy midrange to go with the top-end rush!” Helping to push that power to the ground is a very slick transmission with quickshift and auto-blip downshift features, similar to the BMW’s – only better. So good, actually, that it won top scores in the Transmission category of the scorecard. “The auto-blipping downshift programming is as good as it gets, and suddenly having to use a clutch lever to downshift seems archaic,” says Duke. It’s true, simply close the throttle, reach for the brakes, tap your foot on the lever and don’t even bother with the clutch, the 1299 will take care of the rest. Clamping on the Ducati’s M50 Brembos throughout the day, we were continually amazed how well they performed. Duke, meanwhile, raised the compliments one further, saying, “There is no bad set of brakes here, but the Duc’s Brembo M50s are my favorite, offering huge power and incredibly precise control – the best in the business.” Sure enough, the M50s are the best in the business, as they won the Brake category of the scorecard, too. A generous cockpit area meant even 6-foot, 2-inch Alexander didn’t feel cramped. Chandler was surprised by the roominess, too. Coming in at 427 lbs. ready-to-ride, the 1299 Panigale S is the lightest contender in the field. Couple that with forged wheels, a fine-tuned chassis (no frame, remember) and wide bars providing tons of leverage, and you have the recipe for one thrilling track machine. We were especially impressed with the Duc’s willingness to turn-in and/or change direction. 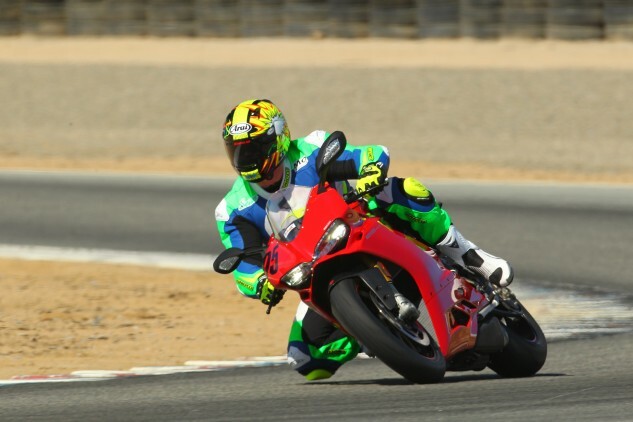 With the traction offered by the Supercorsas and the confidence the semi-active Öhlins NIX30 fork and TTX36 shock inspires, the 1299 Panigale S was seemingly goading me into dragging elbow. Then I remembered this was an actual individual’s motorcycle and my job would be on the line if I tossed it, so cooler heads prevailed. 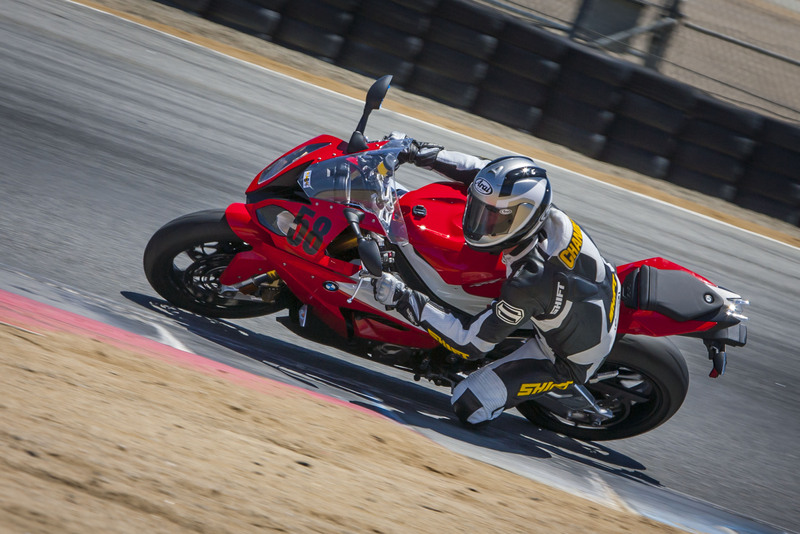 Wide bars give the Ducati rider lots of leverage to turn the bike to-and-fro. The lightest wet weight here also makes that task easier. As is seemingly mandatory in this field, the Ducati comes with a host of electronics, like traction control, wheelie control, riding modes, power modes, Cornering ABS, the aforementioned quickshifter, and adjustable engine braking just to name a few. We could have spent the entire day simply sampling each one of these features, but instead, we focused on the ones that would help us lap faster. So, as the day went on, traction and wheelie control came down, power modes were set to max, and we simply rode. Judging by the fact nobody mentioned any discernible instance of electronic intervention, either in person or on paper, that leads us to believe they’re calibrated so well its intervention was minimal and we just didn’t notice. 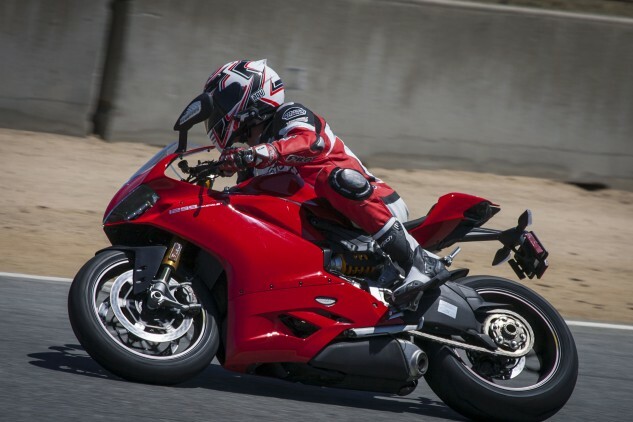 The Ducati 1299 Panigale S is a great bike, no doubt about it. But there’s another Italian we liked even better. As described earlier, the gauge for measuring the podium finishers to this test ultimately came down to smile sizes. 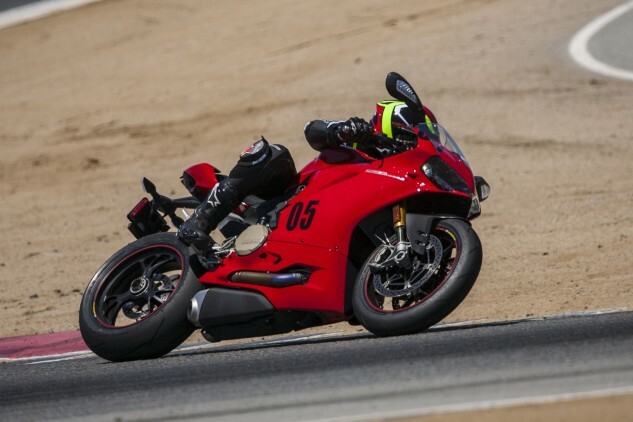 And while the Ducati 1299 Panigale S certainly gave us an ear-to-ear grin, its European competitors, including its cross-town rival, somehow managed to plant one even bigger. 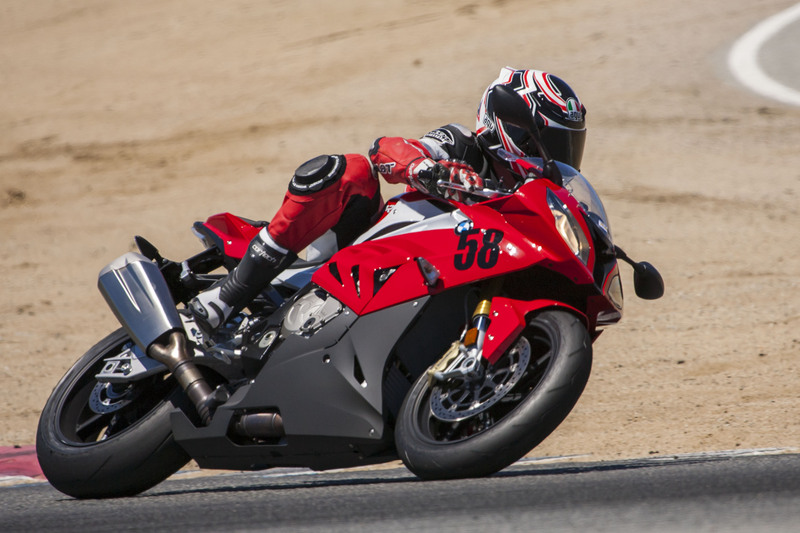 Where the Ducati is a product built by passionate people and designed to instill emotions, the updated S1000RR is all business, with the sole task of getting around a track as fast as possible. It’s headlined by its engine, which has been the centerpiece of the bike from its initial debut. It made the most power here, with 182.9 hp to the wheel measured on the MotoGP Werks dyno, more than 7 horses ahead of the second-place Aprilia, and was the only bike to break into the 180 hp threshold. Its 79.9 lb.-ft. is second only to the thunderous Ducati, the Italian’s 286cc displacement advantage giving it a leg up on the German, to the tune of 12.6 lb.-ft.
Straights are much shorter, and ascents hardly exist when you’re riding something as powerful as the BMW S1000RR. However, co-headlining with the BMW’s engine is its sophisticated electronics, which on our tester included Dynamic Traction Control, Ride Modes Pro, Cruise Control, Gear Shift Assist, Dynamic Damping Control, and… heated grips. This is a BMW, after all. We were surprised to hear Chandler didn’t mind the ride-by-wire throttle of the BMW. For as stoic as he is, that’s about the highest praise BMW will get about its electronic throttle calibration. 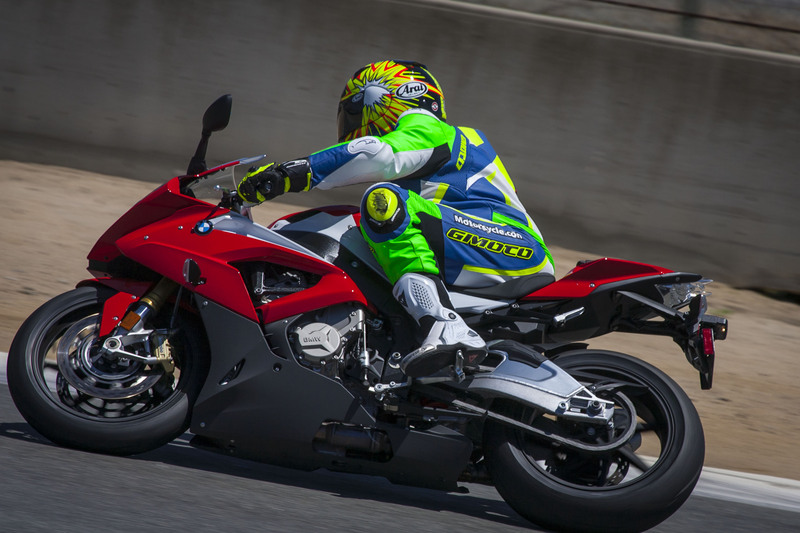 Both the BMW and Ducati were equipped with some form of electronic damping, though the BMW’s system was tops among us, taking top spot in the Suspension category on the scorecard. Duke and Chandler were the only ones who noted anything about the Dynamic Damping Control. Kevin saying, “it seems to help squelch front-end dive.” While Chandler said simply, “the suspension was right there for track use.” While it seems counterintuitive to think less notes is a positive sign, another way of interpreting the scarcity of notes is that the system performed its active damping duties so well it became an afterthought for each rider, allowing them to focus on circulating Laguna as quickly as they could. 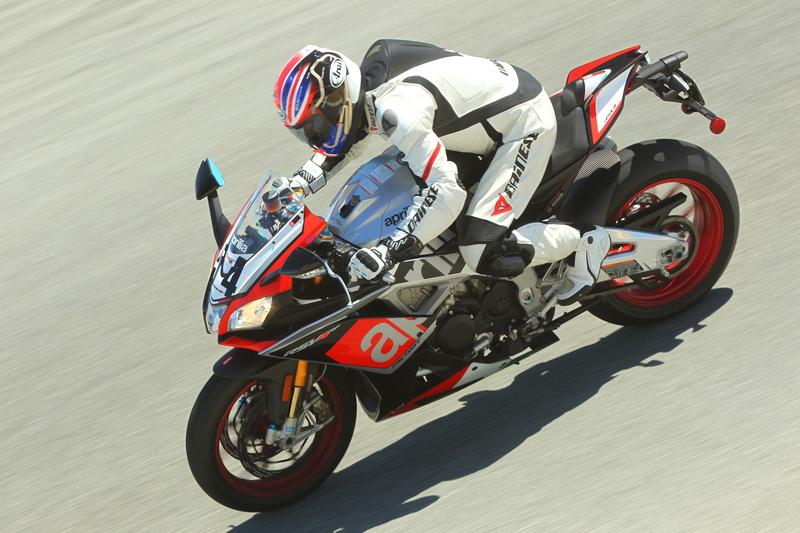 The S1000RR also took top spot on the scorecard in the Handling category, sharing the number 1 plate with the Aprilia. I noted how the able chassis is a perfect complement to the powerful engine, harnessing both power and control. “Great chassis,” Sean says. “Almost as seamless as the Aprilia at speed.” Dirty Sean and I both agree that the RR feels planted and confidence-inspiring on the side of the tire. The optional forged aluminum wheels our tester came equipped with also made a difference on how quickly we could flick it from side to side. Brakes are top-notch as well, the two-piece Brembo calipers and steel-braided lines delivering “stellar power and feel,” says Duke. The S1000RR is very well behaved on the side of the tire, with precise and clear communication coming through the chassis. Traction control is also rather sophisticated, though its different levels were confusing at first, since they are delineated with both positive and negative numerals. With perfect conditions for our trackday and new, sticky Supercorsas, activating the TC was a rare occurrence. Still, the quicker testers preferred TC in the lower settings (or switched off completely in Chandler’s case) as it still provided thrust without completely killing drive. Duke expressed his affection for the RR’s so-called Slick mode which keeps electronic intervention to a minimum and allows the wheelies he loves. Put simply: “Wheelie Control needs to go back to the drawing board,” says Sean. Despite that huge exhaust canister sticking out the side of the BMW, it still emits a ferocious four-cylinder roar when you open it up. A welcome feature is the Gear Shift Assist, which is essentially a quickshifter that allows for shifts in both directions without the clutch. The Ducati is the only other bike here with such a feature. While there were no complaints about the system’s ability to upshift, some weren’t so keen on the bike’s downshifts. “I can’t adjust to it’s downshifter,” says Burns. “I feel no detent whatsoever and I never know what gear I’m in for turn 11 or 2. That’s kind of important.” I felt the same way towards the GSA during downshifts, so much so that I reverted back to using the clutch for down changes. 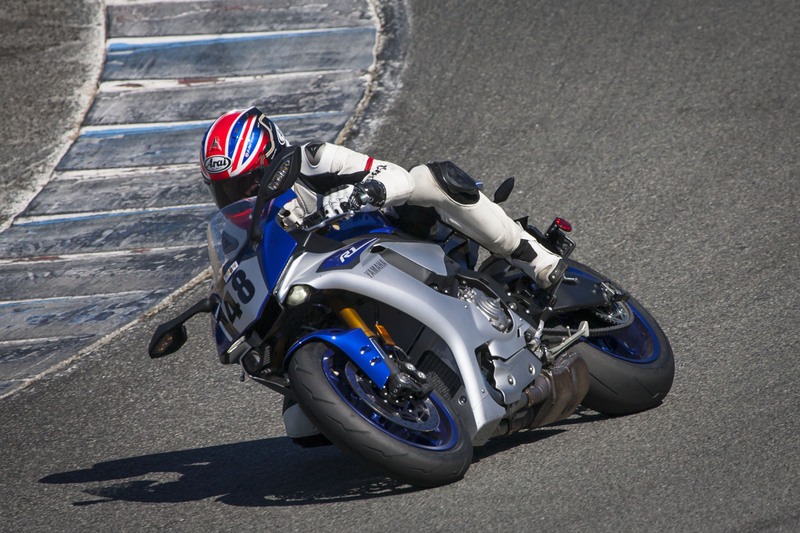 Overall, the S1000RR is simply a track weapon that left us in awe of its capabilities. 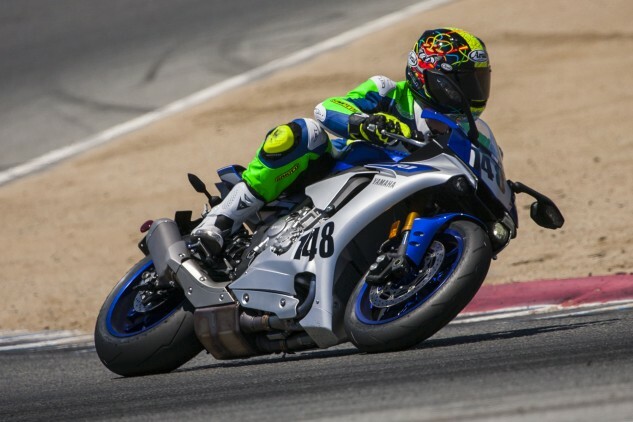 “A very capable bike for the trackday guys or racers,” says Chandler. “The versatile Beemer was immediately easy to get up to speed and feel comfortable,” says Kevin. Sean’s notes the BMW “feels ready to race with the electronics switched-off,” and I jotted “what an absolute rocket ship.” Burns seemed to have the only dissenting opinion, stating, “Not quite the solid feel of the ZX-10R for me.” To each their own. Gear Shift Assist is a nice feature, but it could still benefit from better tactile feel on down changes. 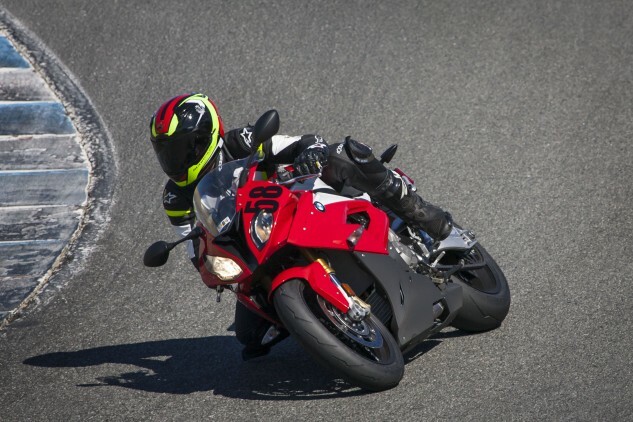 Our quibbles are easily solved with a few button presses or with a slight change in riding style, and once that’s figured out, the S1000RR becomes incredibly rewarding on track. In short, here’s Evans on why the BMW is so good. How close was this shootout? The BMW and Ducati were only separated by 0.8% on the scorecard. The margin is even closer for the BMW and Aprilia. Alas, it’s emotions that slot the S1k only tenths of a percentage point into second place. There’s no doubt the S1000RR is an absolute weapon, but the Aprilia left us enamored. In his notes, Duke wrote, “I’ve always rated the RSV4’s chassis highly, but its engine output had been eclipsed by other literbikes.” The rest of the MO staff has felt the same each time we’ve tested the RSV4. We’ve always loved how much the chassis makes us feel like a hero, but could never quite give it the overall nod because its engine, sweet sounding as it is, would be outclassed by the competition. 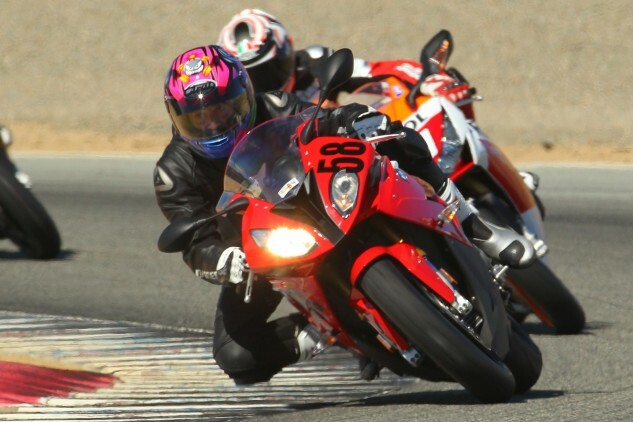 For example, in our 2012 Exotic Superbike Shootout, the RSV4 Factory’s 160.4 hp was a whole 12 hp down on the BMW HP4 and more than 26 horses behind the Ducati 1199 Panigale R! From nearly all performance-related aspects, the Aprilia is seemingly light years ahead of the old Kawasaki and even older Honda. To sweeten the deal even further, as our E-i-C notes, “It’s also the best-sounding literbike my ears have ever enjoyed.” Sean adds to that compliment, noting, “Sounds AMAZING, everywhere, this is a fun and exciting motorcycle at Laguna.” Evans, too, got in on the Aprilia’s melodic circle jerk, writing, “I won’t be alone singing the praises of the Aprilia engine, but I’m gonna do it anyway. The sound of the engine under full-throttle acceleration made me wish that Laguna’s front straight was a bit longer, so that I could enjoy that V-Four sound all the way up to redline in sixth gear.” With excellent power and sound, plus that distinct V-Four character and feel, the Aprilia took the win in the all-important Engine category of our scorecard. Of course, more power and harmonious exhaust symphonies don’t make a shootout winner. Fortunately, the fantastic chassis we’ve loved before is equally as endearing this time around. In my notes, I wrote, “[The Aprilia] seemingly goes where your eyes are looking, fluidly, confidently.” Evans backed that up with his own scribbles. 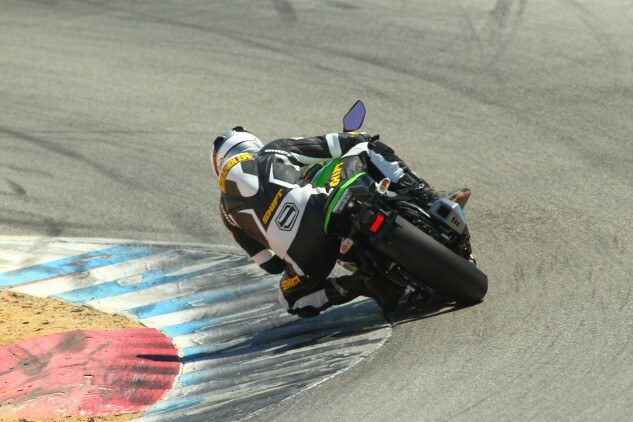 “The bike turned in quickly, falling to the lean angle I desired immediately while still allowing for mid-corner corrections if necessary,” he said. You so much as think about changing direction and the Aprilia will put you exactly where you want to go. The Ducati and BMW were worthy competitors on track and in the scorecard, but in the end the Aprilia leads the way. The Aprilia is not all love and roses, however, as we still found a couple foibles to complain about. Burns noticed an occasional bout of “wonky fueling,” as he called it. 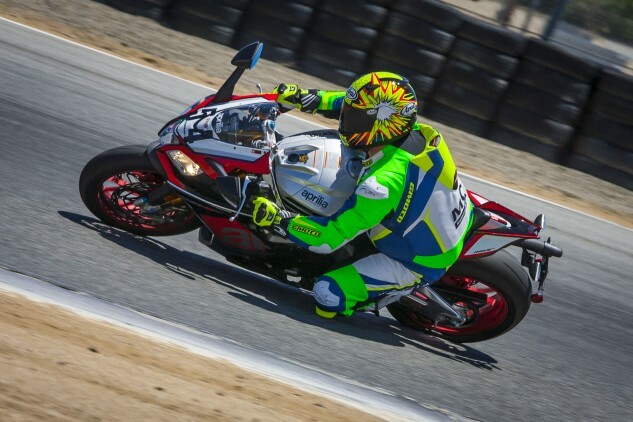 “Sometimes there was one last burp of power after closed throttle.” We liked the quickshifter equipped on the RSV, as it moved up the gears with precision, but it doesn’t feature an auto-blip downshift option, which is likely to become the wave of the future. No matter, as this is “somewhat alleviated by an excellent slipper clutch and light clutch action,” says Duke. Ergonomically, we were generally in favor of the RSV4’s compact seating arrangement, as it is well suited to track duty. However, here’s an interesting perspective regarding ergos from an actual champion, Doug Chandler: “The first thing I noticed was the seat height is kind of on the tall side, not that this a problem, but I was surprised with it. For me at 5-foot, 11-inches it is a nice feel. My years in racing I always had to keep the seat-to-bar distance a bit longer than most for the simple fact that I wanted to have some room with my arms and did not like to feel tight or pushed up over the front of the bike.” That said, vertically challenged riders won’t feel as comfortable on the RF’s 33.6-inch high seat. The Yamaha’s seat is the tallest, at 33.7 inches, but it doesn’t feel nearly that high from the saddle. 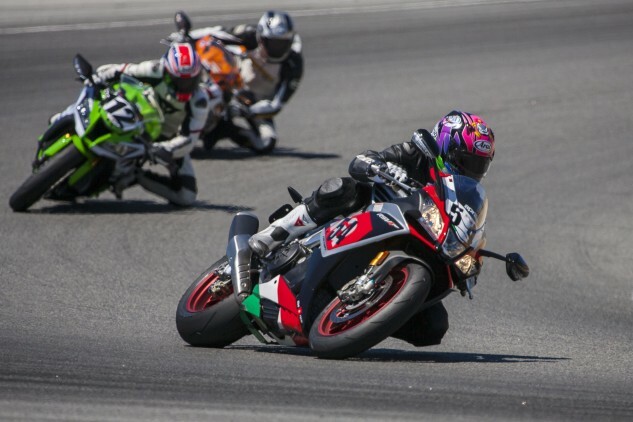 Taller riders might feel a little squished on the Aprilia, as here 5-foot, 11-inch Doug Chandler has his elbows above his knees despite being all the way back on the seat. While they’re not Brembo’s spectacular M50s, the Ape’s slightly lower spec Brembo calipers are still every bit the business when it comes to stopping power. Great feel, with strong, consistent power are all you can really ask for. Duke says they’re nearly the equal of the M50s. Siahaan, seen here, is 5-foot, 8-inches, 153 lbs., and even he makes the Aprilia look tiny. Apparently only small Italians named Max Biaggi look proper aboard the RSV4. It should be noted that the RF took a sizeable ding for its $21,999 price tag. However, Aprilia is bringing these up-spec models into the U.S. before the RR models, and so this was the only option we had for the test. The standard RR version should arrive in late summer, minus only the forged wheels and Öhlins suspension, for a remarkably low price of $15,649, only $50 more than the Kawasaki. If you’re willing to wait, it’s hard to imagine a better deal in sportbiking. 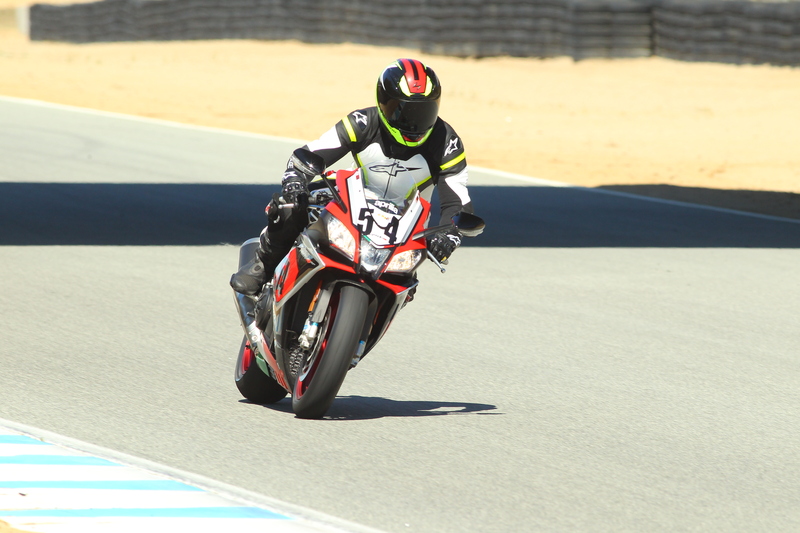 At the end of the day, four out of the six testers gave their subjective overall victories to the Aprilia, and when it comes to the size of our smiles after each session, the RSV4 took a sizeable win in the Grin Factor category of our scorecard. As noted before, we’ve always been a fan of the RSV4, but could never give it an unequivocal nod as the king of the class. Meet the new king of the superbike empire: The Aprilia RSV4 RF. Now, Aprilia answered our pleas with its upgraded engine without ruining the supreme chassis, brakes and electronics we liked before. All the pieces finally add up and we’re happy to award the Aprilia RSV4 RF our 2015 Motorcycle.com literbike champion. Rake/Trail 24.5 deg/4.1 in 23.5 deg / 3.9 in. 24.0 deg / 3.8 in. 23.0 deg / 3.7 in. 25 deg / 4.2 in. 24 deg / 4.0 in. Wheelbase 56.4 in. 56.6 in. 56.6 in. 55.5 in. 56.1 in. 55.3 in. Seat Height 33.6 in. 32.1 in. 32.7 in. 32.2 in. 32.0 in. 33.7 in. Curb Weight 456 lbs. 451 lbs. 427 lbs. 444 lbs. 446 lbs. 438 lbs. Fuel Capacity 4.9 gal. 4.6 gal. 4.5 gal. 4.6 gal. 4.5 gal. 4.5 gal.